to promote virtual world projects. How to use Twitter to promote your virtual world projects. 2013 IPRIGHTS: United Content Creators of Second Life has posted a survey.. Have your say. UCCSL has posted a survey.. Have your say. 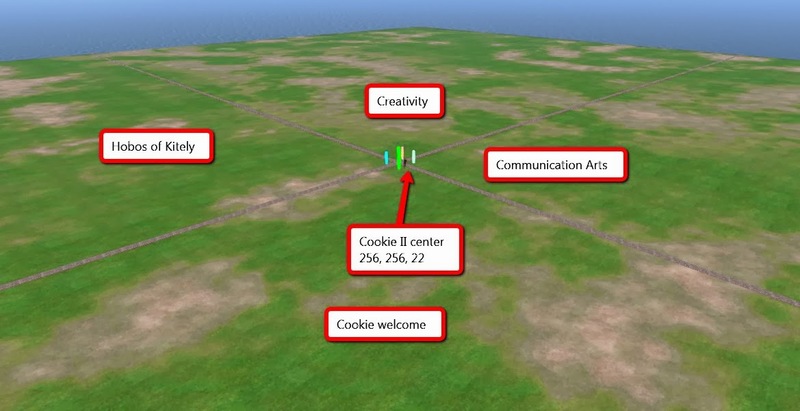 have an effect on what you are doing in Second Life? lead you to look at other grids? affect your attitude towards Linden lab? A video of an acting exercise with open ended scenes at A.R.T. Plays Around Fridays. Actors are given a short scene with ambiguous dialog and perform the dialog with various subtext instructions setting the context. On most Friday evenings at 5 pm in their theater at Cookie, actors of the Avatar Repertory Theater company gather to do scene work or short plays or improv games for the purpose of working together to build ensemble and stretch their voice acting chops. Sometimes they've been known to introduce pieces of material they are working on to develop full length productions -- up to a year-long process! This amazing process, open to the public to come and watch, is called "A.R.T. Plays Around Fridays." On this occasion, MadameThespian Underhill led a small group of actors from the company -- Corwyn Allen, Kayden Oconnell, Ada Radius -- in an exercise of "open ended scenes" -- very short scenes with ambiguous dialog -- to practice playing subtext and intentions through voice acting. The video is from this unrehearsed exercise. Avatar Reptertory Theater is a project of New Media Arts, Inc., a nonprofit organization tax exempt under IRC 501(c)(3). Donations may be tax deductible depending on your tax jurisdiction and circumstances. The poster should be free to copy, and full perm. The script inside is annotated. You only need to put in the link to your group. 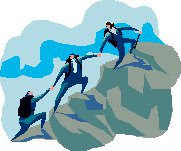 You will need to find a link to your group in place of the link to the Hobo Helpers group. 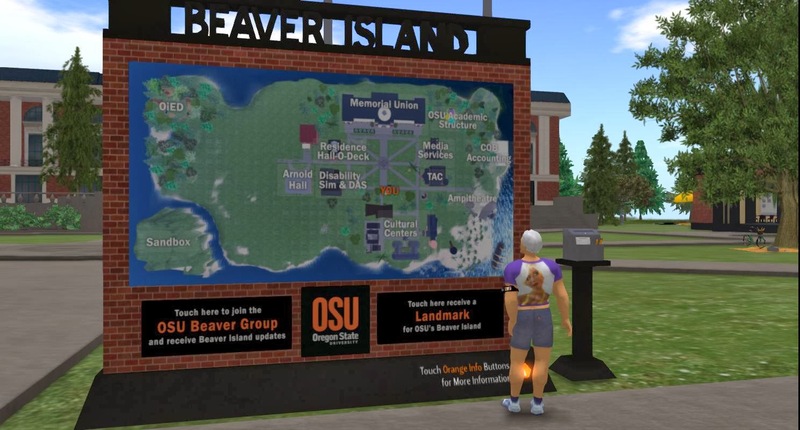 Oregon State University facilities in Second Life, including clever use of holodeck technology. Creations for Parkinson's, the Drax Files. Virtual worlds give you the ability to create and live as you may not be able to in the physical world. From the Drax Files. You have to open a viewer before a Kitely web page will take you to its world. If you have been entering Kitely directly from the web page of the site you want to visit, you will notice a change (forced by changes in Firefox and Chrome). The web page will no longer start your viewer. You have to start your viewer manually. The web page you have been using in the past will give you the sign on information, including the password to use in logging in with the viewer. If you have the appropriate viewer running, the Kitely web page will take you to location when you click on Enter World. You will have other uses for the Kitely world entry page, so don't loose the password to that page. You can use any viewer for Opensim. Firestorm is recommended by Kitely. Here is the Download page. Be sure to get Firestorm for Opensim. Firestorm for Second Life will not work. If you have Firestorm already installed, you can check to see if it is for Opensim: Click Help (top left), then About Firestorm. Look for the phrase " with OpenSimulator support" in the part about Firestorm. In the Firestorm start page, look in the login line for an option: Log into grid: click the dropdown and choose Kitely. If you do not see the Log into Grid option in Firestorm, look to the right for Select Mode and select Hybrid. Use Facebook to promote Virtual World projects. Second Choice? Why not first? Google+ is my top choice for a social media to promote projects. Looking for girls from Ghana who want to get to know you better? Looking for hundreds of requests to join in games? Like to see trick ads that look like regular posts? Then Facebook is for you. Looking for people with serious tech experience and serious interests? Intellectual property rights and how the Terms of Service trap them. Tinker & the Steampunkables an interactive story in a virtual world, pictures and links. 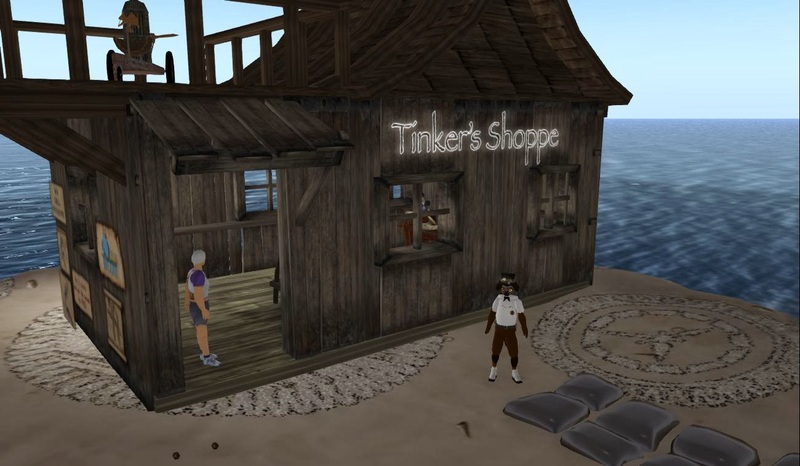 Visit the sim to experience this story with 7 treasures and over 50 great prizes as you meet the characters and chat with the cogs to find out what happened to the Tinker. Steampunk musical to be shown on Nov 23rd at 1 pm SLT. Smoke, smoke...with a blinding explosion followed by unusual dreams of gears raining down on the world…the Tinker awakens in a strange new world in the year 2525. Chat with Cogs and Characters to learn what happened to the lands of Steam Center and fin. "Our pilot show for virtual voice! "We make this entire show ourselves and have all rights to music shown, video done with permissions from people interviewed. If you would like to share this show, please feel free to on your site, magazine pages, homepages! " We need education that develops creativity and adaptability. Children have a vast appetite for learning and it only dissipates when we educate them. Sir Ken Robinson addresses the fundamental economic, cultural, social and personal purposes of education. He argues that education should be personalize to every student's talent, passion, and learning styles, and that creativity should be embedded in the culture of every single school. PROMO: What if there's a world where your imagination is the only limit? The Art of Virtual Reality a presentation on 3D Virtual Environments and how professionals around the world use this platform to promote their real life work or start new ones. Hosted Live by Sophia Yates at the UMass Lowell Inn & Conference Center on on May 11th 2013 and broadcast live by AviewTV.com by Petlove Petshop & Emmo Wei in association with LaPiscean Liberty & Secret Rage. Federal employees are required to take annual cyber security awareness training, typically in the form of eLearning. While these programs provide relevant information they all too often fail to engage learners, and fall well short of promoting behavior change and conviction. After a meeting of the Council of the UCCSL Noon, Sunday, November 3, 2013, and subsequent vote by membership; below are the issues we find of concern in the current Second Life Terms of Service. We hope to work together to resolve these issues, and in the creation of a new terms of service agreement that grants Linden Lab the license it requires while honoring and protecting the rights of content creators. We would prefer to see limitations on the license. We are unsure of exactly what is the intention behind the assertion of this right but the purpose that we glean from the context it is to transfer user content to third parties. 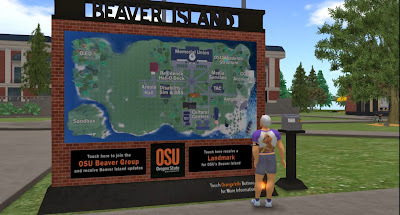 Accordingly, we would appreciate reports of transfers of content so long as we are present (active account holders) in the Second Life virtual world. We would also appreciate some limitations on transfer of content. For example, those creators who have withdrawn from SL due to the change in ToS as well as those who have not logged in to accept the new Terms should be excluded. Another example of an acceptable limitation would not be a restriction at all but a reporting and attribution requirement. Specifically that all creator content sold or transferred by Linden Lab will be 1) attributed to its original creator and 2) a report of the transfer provided to its creator. The perpetuity of the license is somewhat acceptable for member creators as it applies to copies of works already sold and in other inventories until the account associated with that creator is terminated. The perpetuity clause is not acceptable however as it relates to creators’ personal inventories and their original works. We would like a limitation that would reflect that distinction. We would prefer if the license granted to third parties is restricted to the original terms under which the content was originally uploaded i.e. that the third party does not inherit the “unlimited” rights acquired by Linden Lab under the new provision 2.3. The language "for any purpose whatsoever in all formats" is far too broad and unacceptable. We would prefer that language be limited and would appreciate your input in this regard as we are not convinced that the language above adequately recognizes the rights of different categories of content creators, for example visual artists. Finally, I would like to arrange a meeting to discuss the options we present in this letter and to present a few other ideas we believe would result in a more co-operative relationship between Linden Lab and its creator community. Also, please provide an update on Linden Lab's efforts and intention, if any, to modify the current ToS.